Can Ligands of Different Functional Types Induce Distinct Dynamics in G Protein-Coupled Receptors? G Protein-Coupled Receptors (GPCRs) are the most common therapeutic targets for drug discovery by the pharmaceutical industries. 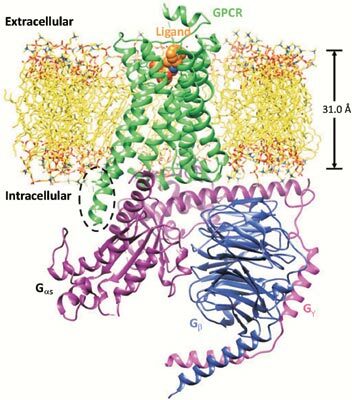 Since 2007, several three-dimensional X-ray crystallographic structures of ligand-activated GPCRs have been determined in their agonist-bound or inverse agonist-bound states, providing a wealth of fundamental resources for the investigation of the atomic-level mechanism of receptor activation and deactivation. A number of computational methods, such as conventional and enhanced sampling Molecular Dynamic (MD) simulations have been applied to investigate the receptor dynamics bound with ligands of different functional types (i.e., agonist and inverse agonist). In this article, we reviewed recent efforts in characterizing the dynamical activation and deactivation mechanisms of GPCRs induced by different functional types of ligands. Keywords: G Protein-coupled receptor, Ligand, Agonist, Neutral antagonist, Inverse agonist, Molecular dynamics simulation, Enhanced sampling, Receptor activation/deactivation, Induced fit, Conformational selection. Title:Can Ligands of Different Functional Types Induce Distinct Dynamics in G Protein-Coupled Receptors? Keywords:G Protein-coupled receptor, Ligand, Agonist, Neutral antagonist, Inverse agonist, Molecular dynamics simulation, Enhanced sampling, Receptor activation/deactivation, Induced fit, Conformational selection. Abstract:G Protein-Coupled Receptors (GPCRs) are the most common therapeutic targets for drug discovery by the pharmaceutical industries. Since 2007, several three-dimensional X-ray crystallographic structures of ligand-activated GPCRs have been determined in their agonist-bound or inverse agonist-bound states, providing a wealth of fundamental resources for the investigation of the atomic-level mechanism of receptor activation and deactivation. A number of computational methods, such as conventional and enhanced sampling Molecular Dynamic (MD) simulations have been applied to investigate the receptor dynamics bound with ligands of different functional types (i.e., agonist and inverse agonist). In this article, we reviewed recent efforts in characterizing the dynamical activation and deactivation mechanisms of GPCRs induced by different functional types of ligands.